The Roll Attack, previously known as Barrel Roll, is Donkey Kong's signature move in the Donkey Kong Country series and Donkey Kong Land series. It involves him curling up and performing a roll. The Barrel Roll was first introduced in Donkey Kong Country, where Donkey Kong can perform the move by pressing . Donkey Kong can use this move on land to attack most enemies, except for Krushas and Zingers. By using the Barrel Roll on a row of enemies, this can prolong the move if done properly and therefore scatter the entire row. Donkey Kong can also use a Barrel Roll to gain some momentum while jumping, usually to cross over gaps. Donkey Kong can also perform the move in Donkey Kong Land if the player presses . 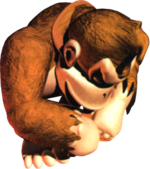 As Donkey Kong is captured in subsequent games, the move is instead used by Kiddy Kong in Donkey Kong Country 3: Dixie Kong's Double Trouble!, where it is known as a Roll. When performing a roll near an edge with water, Kiddy can hop across ponds by pressing on the water; it is sometimes required to reach a Bonus Area, such as in Tidal Trouble or Riverside Race. If Dixie carries Kiddy via Team-up, she can throw Kiddy, who automatically performs a roll. When thrown onto a wall, Kiddy bounces off and rolls back to Dixie. Dixie can jump onto Kiddy while he is rolling, like a Steel Keg. By doing so, Dixie can perpetuate the roll by running onto Kiddy. This way, they would eliminate various enemies with ease throughout their path. In Donkey Kong Land III, since only one Kong appears on screen at a time, Kiddy can only perform rolls by himself without Dixie's assistance. In Donkey Kong 64, the roll attack is one of Donkey Kong's basic moves. To use the move, the player must press and while he is moving. The roll attack is Donkey Kong's signature move yet again in Donkey Kong Country Returns, Donkey Kong Country Returns 3D, and Donkey Kong Country: Tropical Freeze. It can be utilized by shaking the or or by pressing / or / / / (depending on the game and/or control setup) while moving on the ground. The attack technique involving rolling on the stronger character, which had been used in Donkey Kong Country 3, has been brought back, and it was given a name: the Kong Roll. A partner, be it Diddy, Dixie, or Cranky, rolls on Donkey Kong, had the player continuously swing the remote or repeatedly press the button on the game pad. The water skip ability makes a comeback, but it is exclusive to Tropical Freeze. In Super Smash Bros. for Nintendo 3DS / Wii U and Super Smash Bros. Ultimate, Donkey Kong uses the Roll Attack as his new dash attack. ↑ Donkey Kong Country 3: Dixie Kong's Double Trouble! instruction booklet, page 14. This page was last edited on April 14, 2019, at 00:43.